Independent nationalist magazine Attention! Midgård Magazine cannot accept responsibility in opinions expressed in interviews. Opinions are strictly the authors and not Midgård Magazine. Ultima Frontiera is a closed chapter. But, as as a true patron of the fascist art in musical form, has the former members founded KMVII, and promise that they will continue serving you with quality music. Hello Alessandro. Nice to get in touch with you. Would you like to start with introducing yourself? Hello Andreas, I'm glad to be here with you. I'm not here to talk about me, I'm here to talk about us and who we are: friends, fathers, brothers, politic soldiers, there's not one who is better in the band. So, you guys have made the decision to put up a new band. Would you like to tell us about your band KMVII? After a long time and lot of gigs with Ultima Frontiera, we decided to split up but our love for fun and music leaded us to create a new band called KMVII. KMVII in italian means Kilometer 7 and it's where we decided to start again with a new band, the Kilometer number 7 of the ancient Rome street who pass around our towns. 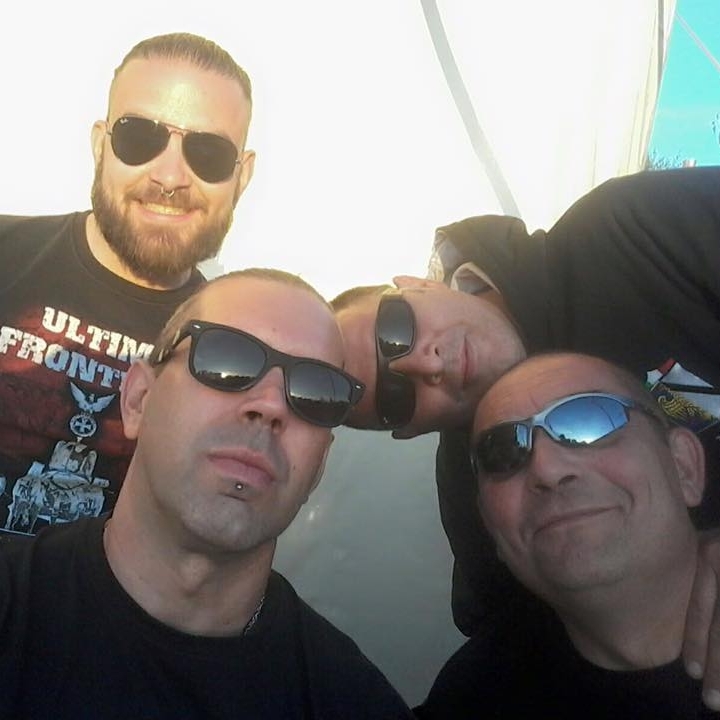 The members are a mix of Ultima Frontiera's members in his history, Alessandro always at the voice, Francon and Ilario on bass and drums (they played in the first 2 albums “Non ci sono più eroi” and “Non Conforme”), and Mattia on the guitar, the last one who joined Ultima Frontiera in the last years. How will KMVII sound compared to Ultima Frontiera? The sound is heavier, because of the influences are changed, we always play as Ultima Frontiera did, but we think sometimes you have to play what really comes out from your heart and mind. We love what we always played but we want to play it louder and faster!! Have you been working on a debut album yet? And when do you think it will be finished for a release? For this year we decide to stop and we confirmed only a gig in Poland on july, the rest of the year will be spent to write new music and maybe during the next year we will release our new ideas. What is the main influence in when you create music? the second one are the lyrics, we talk about stories of our country about what our fathers did for our land on the past century, and our love for fun and partying with everyone who come to see us. What was the reason to put an end to Ultima Frontiera? There are lot of reasons, lot of stories telled from envious people, and lot of crazy impossible stories, but what we can say is that: “everything must come to an end, you just need to be wise to know when the right time have to come”, and 23 March 2013 was the perfect day to say goodbye. 23 march is the day Fascism was born. Thank you and good luck. Hope to hear some new stuff from you very soon. Any last words? Thanks to you and all our friends around the streets, we'll meet you again, we swear! Up the Pints and let's party together.